I’ve solved my craving for good tacos in Wellington by making them myself! I’d like to point out that my favorite kind of taco comes in a hard shell, making it much more tex-mex than authentic. 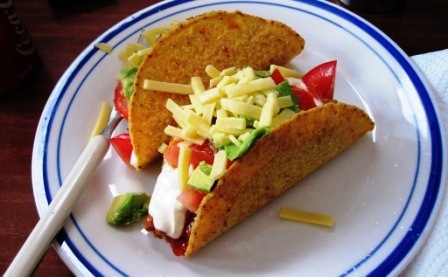 However, hard shell tacos are one of the first meals I remember having as a kid. Consequently they always take me to my happy place, especially when followed by Oreo cookies and a glass of milk. These tacos were made with pork (which tasted just as good as beef), onions, taco seasoning, fresh tomatoes, avocados, sour cream and salsa. While I’m usually my own worst critic, they tasted superb. This entry was posted in Tacos. Bookmark the permalink.